Authors did a remarkable job of condensing in a single (massive) book all topics of interest for a system administrator using the 20/80 rule. The book summaries what you need to know to perform daily tasks (for example the most useful option combinations of commands), using crystal-clear, short, opinionated, and pertinent explanations. 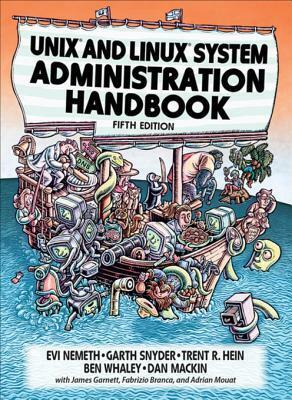 This new edition focuses only on the major Linux distributions (Debian/Ubuntu, RHEL/CentOS) and FreeBSD. It is adapted for those whose systems live in virtualized machines and applications in containers, those whose administrative work largely takes the form of automation, and those who collaborate closely with developers. As a side note, I am a developer working in a production team. This book help me to have a better comprehension of all these tools, commands, and jargons that I face everyday, going beyond the basic knowledge we all have (e.g. we all know what a DNS is but few of us can explain what happens when a browser need to resolve the hostname of a static resource). Therefore, I also recommend this book to developers of distributed applications who want to be proficient in debugging their application for all of these bugs who lurk between two remote components.